Ball valves are mainly designed to conform API 6D (Specification for pipeline valves) and ANSI B16.34 (Valves Flanged, Threaded and Welding End) or API 6A (Specification for Wellhead and Christmas Tree Equipment) in case of upstream applications. Other related standards such as ANSI B16.5 (Pipe Flanges and Flanged Fittings), ANSI B16.25 (Buttwelding Ends), ANSI B16.10 (Face to Face and End-to-End Dimensions of Valves) are also used for the design of ball valves. Also our ball valves are designed to meet FIRE SAFE requirements to BS6755, API 6FA and API 607. Final testing is done to conform API 598 (Valve Inspection and Testing) MSS-SP-61 (Pressure Testing of Steel Valves) API 6D (Specification for Pipeline Valves) or API 6A (Specification for Wellhead and Christmas Tree Equipment) requirements. Materials are selected mainly to ASTM standards and when sour service is specified to meet NACE MR-01-75 (Sulfide Stress Cracking resistant Metallic Materials for Oilfield Equipment). RV valves can be supplied with any kind of automatic operator, such as electric actuators, pneumatic actuators, hydraulic actuators, gas-over-oil actuators, etc. Depending on the application, RV ball valves are provided with a wide variety of trim materials. Metal & Soft Seated valves are available as well as large range of different seal materials covering different services. Carbon steel, stainless steel, duplex and special alloys trims, etc, are available. Standard RV ball valves are suitable for bi-directional sealing. The seat design features a deep pocket with a protective lip which makes the design a long lasting design.The seat assembly consists in an outer metallic seat carrier with a soft seat insert. The soft insert is located into a groove in the metallic seat carrier. The complete seat assembly is floating inside valve body and it is energized by a set of springs which load the seat assembly against the ball preventing leakage from behind the seat. 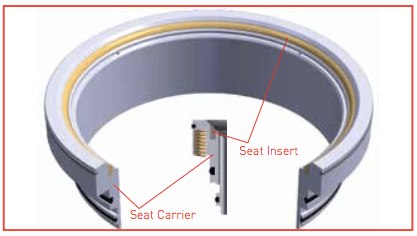 Seat assembly is provided with outer o-ring to avoid leakage through the seat carrier and a graphite back up ring which ensure the tighness in case the o-ring is damaged. Similar seat construction is done in case of metal seated valve. However the seat in this case consists only in a 6 metallic seat ring (without any insert). 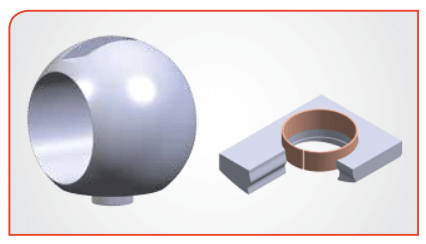 The surface in contact with the ball is hardfaced with Tungsten Carbide, stellite etc., achieving a minimum hardness of 42 HRC to stellite or convectional hardfaced and 78 HRC to Tungsten Carbide or special hardfaced. This makes the design long durable and reliable and able to achieve classes V & VI leakage class. The large diameter trunnions provide smooth, easy operation and extended bearing life. 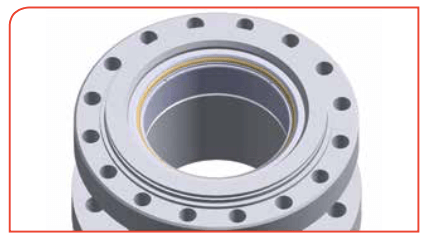 The trunnion bearings are stainless steel with heavy-duty PTFE coated. the bonnet cap. Wrenches are available as an option on full bore through regular port models. 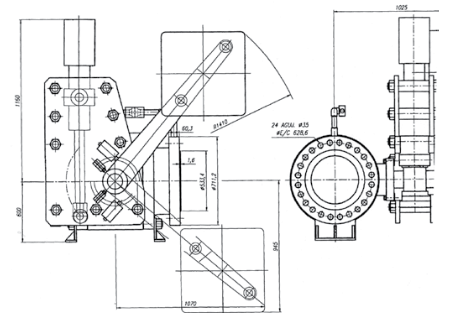 Worm gear actuators are required on all larger sizes for manual operation. 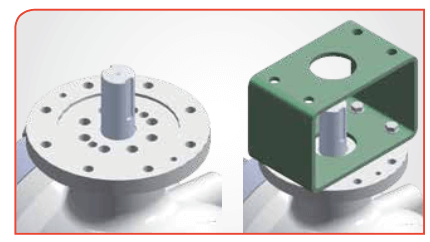 Actuator mounting brackets, shown below, are available as option for users who prefer to install their own actuators. We recommend that buyers specify factory-installed actuators to assure reliable, long life performance and to gain the benefits of RV “single source responsibility, single source warranty” policy. RV Valves can also be provided bare shaft ready to receive any kind of actuator. Three grease fittings are supplied, providing the ability to inject lubricant into both seat pockets and stem area. For manual valves up to 4”, operating lever can be provided. Lever operated valves are also provided with a stop plate valve to avoid travel of more than 4”. 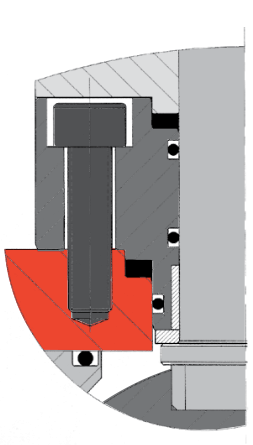 The lever together with the stop plate provides valve position indication. 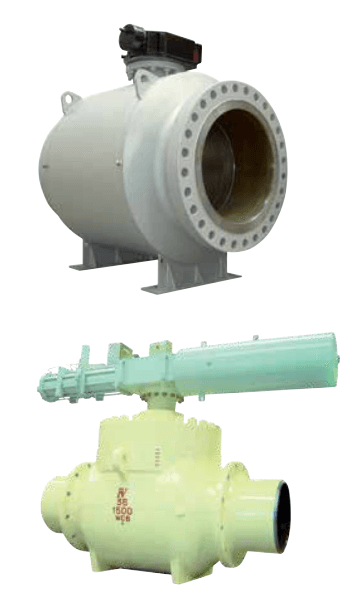 For valves larger than 4”, worm gear actuator is provided. Internal parts that are insulated from the body may build up a static electric charge. 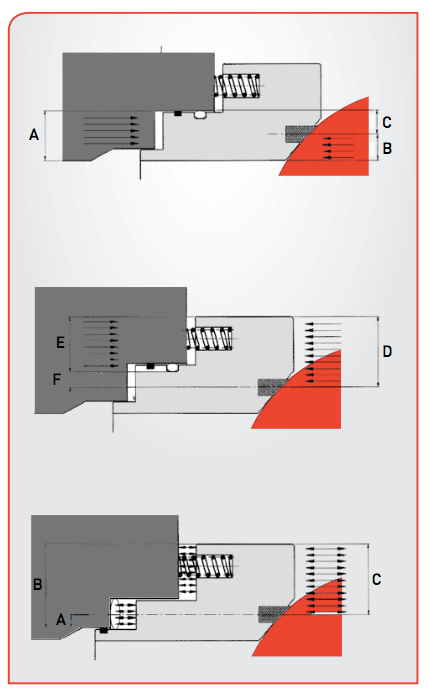 When service conditions require electrical continuity to prevent static discharge, this is ensured by the adoption of coil springs to ensure electrical continuity between body, ball and stem. A stem extension is a need when valves are being installed in underground pipeline making the valve operator non accessible. RV valves offer a wide variety of stem extensions for manual operated valves as well as for actuated valves, including gas- over-oil operated valves. The stem extension includes the complete system of grease injection, actuator gas supply, etc as a part of it. The seat assembly, either soft seat or metal seat, which seals against the ball is provided with coil springs on its back side. The coil springs press the seat assembly against the ball making sure the contact between the seat area and the ball even in absence of line pressure. When line pressure increases, the seat differential area (C=A-B) creates a piston effect forcing the seat against the ball. This additional load increases the effectiveness of the seat/ball interface. The higher the line pressure is the greater the piston effect. a pre-set pressure in the seat, the seat assembly will automatically back-off to relieve the excess of pressure. With normal floating seats a ball valve is-bi-directional, creating a single seal on the seat exposed to line pressure. The opposing seat vents pressure downstream. If the upstream seat fails, it may be appropriate to use the downstream seat as a back up seal to the primary seat. Modified seats can offer this feature. The outer diameter of the seat is designed with a double piston profile, exposing more surface area to cavity pressure that a normal floating seat. In the case of an upstream leak, this enhances the contact pressure between downstream seat and ball. The differential area A= B-C creates a piston effect forcing the seat against the ball. In such cases, it is recommended that an automatic pressure relief valve be installed to protect the body cavity from excess pressure. 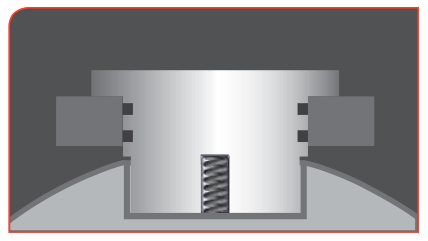 As an option, it is possible to adopt the double piston effect on one side only. Although this eliminates the need for a pressure relief valve, it does make the valve uni-directional. Because the floating seats seal, both upstream and downstream, simultaneously, double block and bleed procedures can be performed. With the valve under pressure, the body cavity may be vented or drained to the atmosphere through the bleed valve. RV valves are always provided with anti-blow out stem design, which ensures total safety and integrity. RV valves are of FIRE SAFE design, which substantially prevent the leakage when valve is subject to high temperatures. In case of fire accident inside the valve, seals, and seat inserts (for soft seated valves) are melted and then a metal to metal seat is made between the metallic seat and the ball ensuring a degree internal sealing tightness. All o-ring are also disappeared and only graphite back-up rings remain in seats and valve stem, making the valve tight for leakages to the atmosphere. RV valve designs conform requirements of API 6FA, API607 and BS6755. Killed carbon steel for low temperature applications. High resistance allow steels for API 6A applications. Materials also meet the requirements of NACE MR-0175/ISO 15156 when sour gas services are specified. Our technical staff is ready and available to provide customized material selection for those special customer applications RV always provides the customer with suitable information of material selection which is agreed prior valves are manufactured. For majority of industry applications the following table gives the main guidelines of material selection. Carbide, Chromium Carbide, etc, being the base materials selected upon the valve application and the design pressure/ temperatures. VITON including its alternatives of high temperature VITON (up to 210/oC) and VITON for explosive decompression. Others depending on application. Lip seals are used normally for more severe applications such as cryogenic services, high temperature or also in nuclear valve application (when the seal must be radiation- resistant). The lip seal is made of different materials such as PTFE, stainless or inconel alloy. 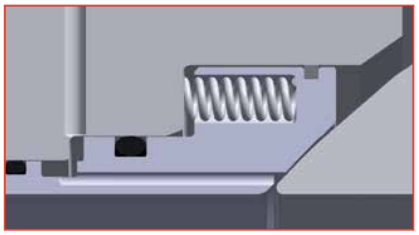 Lip seals must be mounted in the positive direction of pressure in such a way that fluid improves the sealing load of spring. PTFE or Teflon suitable up to ANSI Class 600. Nylon suitable for high pressure, and for temperature range up to 120ºC. Devlon suitable for high pressure, and for a wider range from low to high temperature. PCTFE or KEL-F suitable for low temperature up to -196ºC. PEEK suitable for high temperature up to 260ºC. 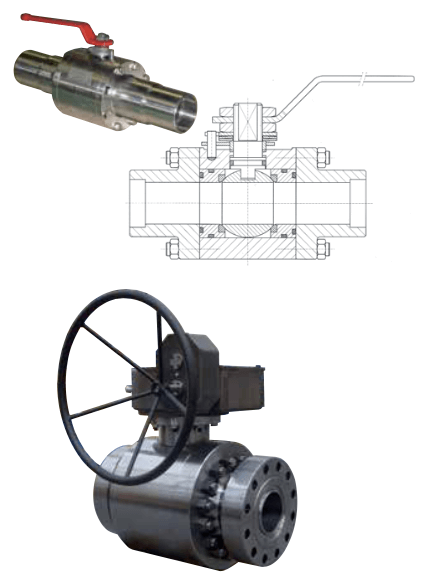 This valve is used in gas pipelines and the actuator is powered directly from the line gas pressure. 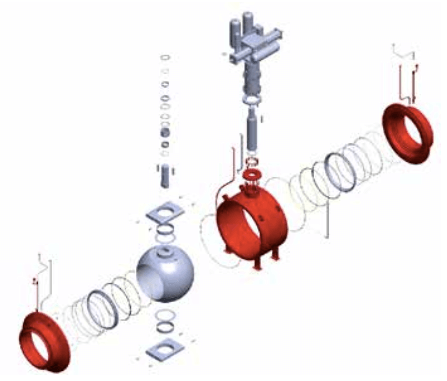 Valves actuator may be provided with line break detection system which closes the valve in case that the gradient of pressure drop in the line is greater than a preset value. 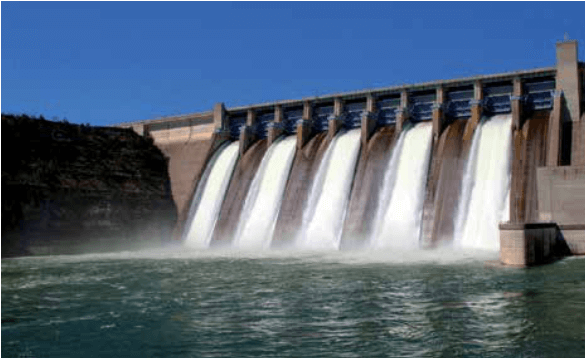 in hydroelectric power stations. Valve is assembled in horizontal position and provided with a hydraulic piston to open the valve. In case of reverse flow which may damage the turbine/pump, this is detected by a pressure transducer which sends a signal to the valve releasing the pressure in the hydraulic piston and allowing the valve counterweight to close the valve in few seconds avoiding line counterflow to reach the turbine/pump. Fully Welded ball valves are available for those cases when leakage throughout atmosphere must be absolutely avoided such as in gas transmission pipelines. Valve is built in three pieces fully welded constructions. The Top-entry valve types have a major application when a frequent maintenance must be carried out and the valve can not be easily removed from the pipe. In this valve model, all the internals can be easily dismounted by loosening the bonnet of the valve and removing the ball, the seat-holders and the shaft. When mounting the valve again, the seat-holders have a system to regulate the compression of these to the ball. For sizes up to 6”, this type of valve can be used giving the same possibility of maintenance as top entry ball valve but being a construction much more economical. For upstream applications, three pieces side entry ball valve is used in accordance with the requirements of API 6A. Valve classes from class 2000 to class 20000 In sizes from 2-1/16” to 7-1/16” are available. Material selection is done in full compliance with API 6A requirements. Valve designs are available to meet Pressure Product Requirement levels PSL-1, PSL-2, PSL-3 / PSL-3G and PSL-4.